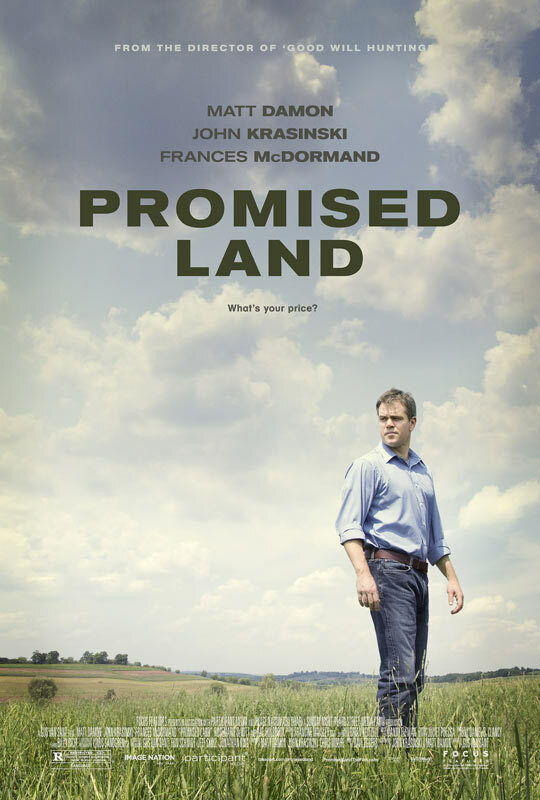 Sixteen years after the release of “Good Will Hunting,” critically acclaimed American film director Gus Van Sant and Golden Globe award-winning actor Matt Damon have unexpectedly managed to reunite for Focus Feature’s new contemporary drama, Promised Land. The story starts in a rustic farm-town in upstate Pennsylvania, where businessman Steve Butler (Matt Damon) is on a mission to get signatures to allow his natural gas company to hydro-frack on local farmland. While there is mixed feedback from the community, seemingly good-natured and openhearted Dustin Nobile (John Krasinski),emerges on a quest to prevent hydraulic fracking. It’s almost impossible to not to fall in love with Krasinski’s character as he butchers Springsteen’s “Dancing in the Dark” at the local karaoke bar or as he teaches elementary school children about the dangers of fracking. We later find out that Krasinski actually has a dark secret of his own, which ends up leading to Damon unexpectedly becoming Promised Land’s Mr. Desirable. Van Sant’s and Linus Sandgren’s composition and lighting choices were definitely the film’s biggest strength. Sandgren insisted on only using warm and natural light, and negative fill for contrast, to give off an extra organic vibe. The lighting choices along with the bird’s-eye-view wide-angle shots of green farmland, and cozy scenes of backcountry cottages definitely evoked an intended “crunchy-granola” feel. While I did feel as though I was learning a lot about the science of fracking, Promised Land was very preachy and one-sided. The writer of the story, Dave Eggers, cast an extremely greedy or ignorant light upon anyone that is pro-fracking. The pro-fracking characters in the movie either only solely intended on making money, or were blatantly unaware and ignorant of any of fracking’s negative affects. Promised Land also failed to give any insight into the possible benefits of obtaining natural gas locally. Though it was maybe an entertaining flick to some viewers, Promised Land bias kept it from being as informative as it could have been. Parts of the movie were also very slow; about 15 minutes of Damon’s brooding could definitely have been cut off to create a more concise hour-and-a-half film. While there were very pretty shots and endearing scenes between the film’s beloved stars, Promised Land was not a movie worth paying $11 to watch. Although viewers shouldn’t be completely molding their views on obtaining energy resources from this movie, it can appropriately be enjoyed for viewing lovely scenery, and for taking lengthy journeys into the teal irises of Matt Damon’s eyes.